HA NOI (VNS)— Doctors have warned the public to be careful when eating wild mushrooms following the deaths of two people in northern Thai Nguyen Province on the weekend. 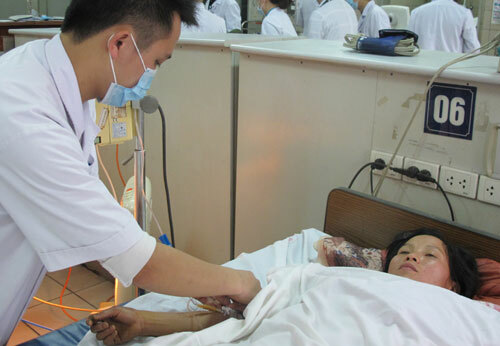 The Bach Mai Hospital's Poison Control Centre in Ha Noi on Sunday received four additional patients from northern Tuyen Quang Province suffering acute poisoning from eating mushrooms, bringing the total to 14 people so far this year, including two fatalities. The four patients, belonging to the same family, had eaten wild mushroom collected from a local forest, said the centre director Pham Due. "They were rushed to hospital 58 hours after eating the mushrooms. All of them now remain in a critical condition, with liver failure", Hue told Lao Dong (Labour) Newspaper. The event follows an admission last Thursday of five family members in Thai Nguyen Province to the General Hospital having also eaten poisonous mushrooms. The victims, aged between 12 and 35, reportedly showed signs of stomach ache, vomitting, nausea and diarrhea. In a similar case, the hospital received five members of a different family on Sunday, who had suffered serious damage to their livers and digestive systems and showed signs of vomiting, nausea and a drop in blood pressure. They are now being treated at Bach Mai Hospital's Poison Control Center. Of the 14 patients, only one is in a stable condition and two have died. The remaining patients have suffered serious liver damage, said Due, adding that all of the victims had digested large, white mushrooms which they believed to be edible. Bach Mai Hospital doctors warned people not to eat wild mushrooms as it was very difficult to distinguish between edible and poisonous mushrooms. Spring is a particularly bad time of year for mushroom poisoning with drizzling rain allowing wild mushrooms to grow on a wider scale, doctors said. While waiting for an ambulance, patients poisoned by mushrooms should induce vomiting, and take activated charcoal and laxatives, said Bach Mai Hospital vice director Do Doan Loi. Mushroom samples taken from 12 enterprises around Ha Noi deemed safe to eat, according to a recent inspection by the city's Food Safety and Hygiene Sub-department.